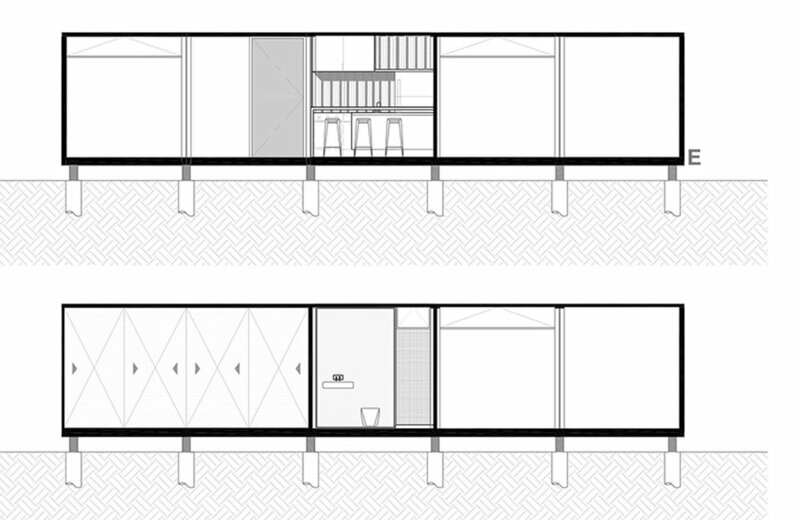 Our office offers complete set of drawings for shipping container homes, of various sizes. Having built several projects using shipping containers, we are often asked to provide expertise and drawings to help others fulfill their dream of building and living in such unique environments. These drawing packages are pre-designed and can be customized for additional hourly fees. Below are standard floor plans for these homes, ranging from a studio model of 480 square feet to a 3 bedroom arrangement of 2,400 square feet. A complete set of architectural drawings is $2,550.00. Structural drawings can be provided for an additional fee of $1,500.00. Customization for these base models are charged on an hourly basis, at $250/hour. A 3-bedroom + office/den arranged around an outdoor courtyard. This plan is perfect for a family and in a location with a wide site. This home is designed with 2-bedrooms plus optional office/den and two bathrooms. A 1-bedroom 1-bath arrangement. This can be a great addition to existing homes looking to create a separate space for guests or additional rental income in their property. Our smallest model is a 480 SF studio. This can be a great addition to existing homes looking to create a separate space for guests or additional rental income in their property. The structural rigidity in the metal corrugation of the shipping containers equal more than standard timber, or steel and concrete construction. This factor leads to ease in stacking and joining, as well as in creating foundations. The thin frame allows for more square footage within the same footprint as a standard construction, making it a particularly enticing option for any large and small scale housing. Construction time from start to finish is significantly reduced. Once a plan has been selected, the container supplier prepares the unit by cutting the specific openings for windows, and door, or by completely removing sides. Windows, flooring, and other finish materials are easily installed with standard dimensions and pre-assembled framing. Our studio created a complete concept package with modular residential units ranging from single level 480 square feet units up to 2,400 square feet multi-story models. This may be arranged as a multi-family residential complex, with various configurations for circulation and lay-out. Modular green roofs provided by green grid with plant species that vary with location, and that includes sedums and small grasses may increase thermal capabilities for the space thus lowering the need for mechanical heating and cooling. The use of radiant floor is the most environmentally conscious and economical way to heat. This system is provided by warm board, consisting of plywood and radiant pipes in modular sizes. A covered balcony may be added to the container on either end sides, providing protection and extending the interior space out.